Ellis Marsalis, Jr. — the paterfamilias of the jazz-playing Marsalis clan — says he was “never big on family bands.” Maybe that’s why even after the Marsalis family performed together for the first time during a retirement celebration for Ellis in 2001, they still don’t play as a family all that often. The sole date on their online schedule is their Clowes Hall show. And then they’ll go their separate ways: Wynton with his Jazz at Lincoln Center Orchestra; Ellis, Branford and Jason with their respective quartets; Delfeayo with the Uptown Jazz Orchestra; spoken word artist Ellis III to wherever it is that he issues his oracular judgments on American life (Wynton will have more on that in a minute). Born in New Orleans in 1934, Ellis Marsalis, Jr. came up as jazz pianist, playing in a modern style that wasn’t obviously indebted to Dixieland and R&B, before moving into education, eventually teaching on both a high school and university level, notably at the New Orleans Center for Creative Arts. He and his wife, Delores, have six sons, five of whom will perform at Clowes. There’s Branford, an adventurous saxophonist who’s worked with Art Blakey, Sting and the Grateful Dead and briefly served as musical director for The Tonight Show. Wynton, a nine-time Grammy winner, long-time artistic head of Jazz at Lincoln Center and notorious contrarian. Ellis, who contributes spoken word monologues to some Marsalis Family gigs. Trombonist Delfeayo, who has followed directly in his dad’s path in becoming a New Orleans-based educator. And drummer Jason, the youngest Marsalis, who has spent more time performing with his dad than any other son. Feel free to consult Wikipedia or, hell, the Grove Dictionary of Music for more information; for now, to the interviews! NUVO: So, who calls the shots at a Marsalis Family show? Your dad? Wynton Marsalis: Yeah, we go along with him, whatever he wants. He sacrificed for us so much, we have so much respect for him that it’s not a problem. NUVO: Is there any different sort of chemistry when playing with your family vs. playing with other talented musicians? 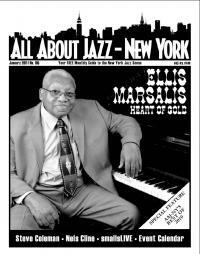 Ellis Marsalis Jr. has accomplished a lot during his distinguished life in jazz - creating beauty as a firstclass pianist and composer, guiding and inspiring budding musicians through his unswerving devotion as an educator in or near his hometown of New Orleans and with his wife Dolores producing a family of six that includes four high-achievers with notable jazz lives of their own.